This futon frame is for the minimalist. No bells, no whistles, just clean lines with an open armrest for a light feel and a modest style. 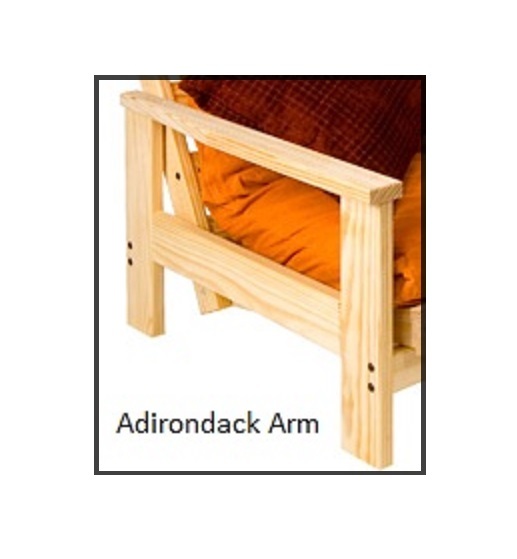 It comes in all sizes, so you’ll be sure to find the perfect futon frame for your space. Ships easily in two boxes and comes with everything you need to set up your futon in a flash. We’ve all had one, or at least probably handled one along the way. You wouldn’t think much about a futon unless you’ve had to choose one or use one. Turns out there are many details regarding futons…cost, comfort, ease of shipping or pickup, how to operate one, what kind is best, etc., etc…We’re here to help simplify your options. Shown here is the ADIRONDACK style. It is a low-profile style, so it blends easily into the environment. Its modest stature has a lighter feel than the other styles because the side is totally open. The armrest is 21.25-Inches high.